In a perfect world, we would all be able to hit the range a couple times a week for some target practice and burn through a couple hundred rounds of ammunition to keep our drawing and shooting skills honed. Even without skyrocketing ammo prices (when you can find ammo, that is) this still requires packing up all your gear, traveling back and forth to the range and cleaning everything once you’re finished. Dry firing practice at home can be a useful way to practice drawing, trigger pulling and manipulating firearm controls while saving your ammo and range fees, but it isn’t quite as good as the real thing. We got a chance to look at a number of products at SHOT Show 2013 that provide a happy medium between range time and standard dry fire practice. These products include the Beamhit line from L-3 (think EOTech), Top Gun computer-aided shooting training system from Op.Electronics and the Laser Trainer line from Laserlyte, each of which allows you to train at home with your own (unloaded!) firearm. It should go without saying, but when performing any type of dry fire practice, be absolutely certain that your firearm is unloaded! Also, be sure to review your firearm user manual or contact the manufacturer to make sure that dry fire practice is OK for your firearm. “Snap Caps” may also be something that you want to include in the mix. The Beamhit Laser Marksmanship Training System (LMTS) covers a range of equipment from basic, portable laser and target systems to more involved PC-based systems that project realistic shooting situations onto a wall or projector screen. The Beamhit 390 series is one of the more advanced laser training systems that I got a chance to look at. The standard 390, which includes the bare minimum laser and camera systems and paper targets, has an MSRP around $1,800. An upgraded 390v5 model, which also includes projection and sound systems, pushes the price up to nearly $9,000. Similar systems are also available for rifle marksmanship training. I got a chance to use the 390v5 at the EOTech/Beamhit show booth and it seemed to be a good system, if not perhaps a bit out of the price range of many casual shooters. This system has a number of shooting scenarios beyond just static targets, from simulated standard shooting ranges to moving targets like clay birds or balloons and shoot/don’t shoot scenarios. The system also provides a variety of scoring modes and training “games.” One such game is a timed run at shooting a number of simulated steel plates. After just a few practice runs on the system, I trimmed several full seconds from my time. There is no doubt that repeated use of a system like this could greatly improve shooting skills. The more affordable line of Beamhit systems includes self-contained models like the 110 and 115 systems whose MSRPs range from $319-379. These systems give up many of the bells and whistles available on the higher end models but the cost savings are hard to ignore for household users (as opposed to training facilities). These systems, which keep track of hits within the unit, were not set up for use at the booth, but appear to operate similarly to the Laserlyte units described below. Beamhit also offers intermediary systems such as the 190 line which combines the portability and price of the self-contained units with improved, PC-based feedback. The next system we looked at was the Top Gun system from Op.Electronics, which was also set up for a live demonstration so we gave it a try. This PC-based system seems to offer a number of the features that the PC-based Beamhit systems have but at a much lower price (MSRP $299). The Top Gun includes five training modes: targeting, aiming, triggering, quick response and game mode. The feedback from Aiming mode (shown in the booth display at left) and Triggering mode show, respectively, the point of aim leading up to and following the shot or point of aim at trigger pull versus point of impact (POI), are particularly useful for improving shooting form and basic mechanics. The basic Targeting mode simply shows POI and calculates shot dispersion. Quick Response mode tracks the time-to-shot from the “shoot” command and POI. 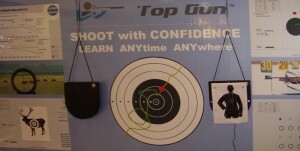 The Top Gun Game mode allows multiple shooting rounds and scores the better grouping to determine the winner. Despite the decent feature set and reasonable price, the Top Gun does have several drawbacks. The first is that it is not a fully self-contained system like the Laserlyte or Beamhit 110/115 units. The unit containing the optical sensors and electronics, which is inserted into the barrel, must be connected to a PC (not included, Windows XP/Vista/7/8 only) running the Top Gun software via a USB cable. This means that the cost of a computer must be factored into the equation as well as the fact that you also have to lug it around. This connection requirement also prevents using the system to perfect aspects of shooting such as drawing from concealment or shooting from unconventional positions which would be more feasible with a simple laser barrel insert. The last set of dry fire training systems we checked out at SHOT were the offerings from Laserlyte. Similar to the Beamhit 110/115 units, the Laserlyte models are self-contained targets that register hits from sound-activated laser units inserted into the chamber or barrel of your firearm; both of which allow for practice of drawing from concealment and firing from unconventional positions by virtue of not being tethered to a computer. The TLB-1 Laser Trainer Target (shown at right) is endorsed by Rob Pincus’ I.C.E. Training and was NRA’s 2012 American Rifleman Accessory of the Year. As noted above, this unit registers “hits” from firing pin activated laser inserts but, unlike some of the other units, hits are not displayed as soon as they are made. Rather, hits are displayed only after shooting the smaller “display” area with the laser and are cleared by shooting the “reset” area. This is done to ensure that the user is focusing on the target itself rather than the glowing LEDs representing the hits. In addition to the standard TLB-1 target above, Laserlyte also offers the TLB-RT “Reaction Tyme” targets, which come in a sets of two. These targets go “hot” for random intervals of three to seven second windows during which they will register hits, allowing users to hone target acquisition and shot placement skills. An additional benefit of the Laserlyte system is the interchangeability of all of the components. Given this modularity, each component is purchased separately so the user can get as many or as few options as they want or need. The TLB-1 and TLB-RT targets have an MSRP of $230 and $175, respectively. The LT-PRO universal pistol laser unit, which is inserted into the muzzle of 2″ or longer from 9mm to .45, retails for $120. For an even more streamlined training experience, there are also training cartridges that are inserted directly into the chamber which are offered in a variety of calibers and gauges as well as chamber adapters for larger rifle calibers. The Laserlyte system is one that I have been drooling over since I first heard about it. This long-standing infatuation, combined with the SHOT Show special they were offering, prompted me to finally spring for a TLB-1 and LT-PRO (and made me wish that I had brought along a pistol on this trip). I have been having a lot of fun and getting in some cheap target practice in over the past couple months and the system is working out great. The only issue I have, which could arise on any of these training systems with certain firearms, is that the trigger does not always reset after firing. This is easily fixed by quickly releasing the trigger, thumbing the hammer or partially/fully cycling the slide. If you are having a tough time balancing your yearning for target practice versus the current ammo situation, any of these systems could be a worthwhile option to look into. If you have used these systems or others like them, let us know about your experience in the comment section below or in the Gear Review section of the GunLink forums. Sure, Ann. I can give you some info that might help, but it’s sort of a tricky situation on the Glocks, especially the sub-compacts, as some of the accessories I mention may be meant for longer grip-frames. I also invite you to stop over to the GunLink Forums to ask any other questions you might have or to get your question in front of a bigger audience. First, we want to say to always, always, always practice the four laws of gun safety and always make sure that your firearm is unloaded and your ammo is out of reach whenever you do dry fire practice. Getting things like this to work on a Glock is tricky since it relies on the “click” of the action, and the trigger doesn’t reset. Some lasers might be hit or miss on whether the Glock’s firing pin dropping is loud enough to reliably set them off when the trigger is reset. There is a great solution to that – the trigger reset kit – but it costs $200 and you have to take your Glock pretty far apart before and after each practice session. You can manually cycle your slide a fraction of an inch – just enough to reset the trigger – but that doesn’t allow you to practice multiple successive shots when you have to keep coming off the pistol with your support hand to manipulate the slide. We did a write-up on the Ready Shot system that works with Glocks because it relies on a magnet system and a special magazine that keeps the trigger reset. It doesn’t “click” but it pulses the laser every time you pull the trigger. It was a great product and solved “the Glock problem.” Unfortunately, we haven’t heard from Brent, the designer, in a while and his website appears to be down. I talked to Stan from DryFireMag a while back and he assured me that his product – a magazine with a mechanism that clicks on each pull – is loud enough to activate the LaserLyte unit. I’ve never actually seen it work in person though. We exchanged a few more emails and were talking about arranging a demo, but then he disappeared too. His site is still up and he has his units listed for $100, so they are presumably still in business. LaserLyte (and probably others) make blue trainer pistols that will accept the laser device and it “clicks” to trip the laser when you pull the trigger. The problem there, however, is that you aren’t practicing with your own carry piece, which kind of defeats the purpose of this exercise. Barring the above solutions, there is a trick you can use to get in dry fire practice with your Glock. It will let you practice drawing, acquiring your target and sight picture, and pulling the trigger, but you won’t get as good of feedback as you would with the laser device. You can (after clearing your weapons), partially pull back your slide just enough to get a gap between the breechface and barrel, and place a short strip of zip-tie or doubled-over cardstock in the gap, and ease the slide forward. This will keep your Glock far enough out of battery that the sear will not disengage from the trigger, so it technically is never pulled all the way and, thus, never needs reset.